You only have a few seconds to catch the shopper’s attention, so what are you going to do with your packaging to not only catch their attention, but to get them to want to buy your product? Highlighting innovative shape. Kids like products that feature fun colors and design in their packaging. Clear Beverage Corp. did just this with their “Kid Fuel” naturally flavored water. They also designed the shape of the bottle to resemble a sports bottle with curves for a child’s small hands to easily grip. They also made the packaging educational. Each bottle has a quiz question and Professor Smart’s answer is revealed after the beverage is consumed and the bottle is refilled with water. Sizzling as bacon’s main ‘touchpoint’. It is important for the packaging of a premium product to reflect the quality of the product. Tyson changed the packaging of their bacon by adding a label that featured a gold-outlined shield area with red, white, and gold on a blue background, while still leaving room to view the meat. The new design improved how easy it was to find and recognize the brand. Encouraging participation. 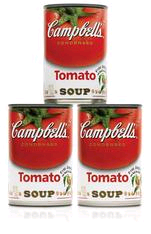 Campbell’s made 7.5 million special-edition labels to show the quality ingredients that they use. Along with the new label, they started a program where you enter a code online from your can to receive a free pack of tomato seeds for yourself, as well as 100 seeds for urban communities and schools. Pulling double duty. Sometimes marketers have to create a package that both attracts attention, as well as protects against theft and counterfeits. Nutrex Research did this by creating a shrink-sleeve label that is both eye-appealing and protects the product from tampering. Signaling cause marketing. People like companies that help people and allow the customer to help by purchasing the product. Tide showed this with their packaging for the Loads of Hope campaign. They have special yellow caps that read, “You can help”, and it features pictures of Hurricane Katrina victims on the front.